Hispanic Association of Colleges and Universities - Ringside for ¡Adelante! SAN ANTONIO, Texas – Platinum tickets for a May 22 fundraising luncheon in San Antonio for the ¡Adelante! U.S. Education Leadership Fund will come with ringside seats for a 2003 Miller Lite Texas Title Belt Series event May 22 in San Antonio featuring two-time world boxing champion “Jesse” James Leija. Six-time world champion Oscar De La Hoya will address the fundraising luncheon for the national Hispanic scholarship and leadership program at noon May 22 at the Adam’s Mark Hotel in downtown San Antonio. De La Hoya later will be ringside, too, promoting the May 22 boxing event at the SBC Center, which will be televised live on HBO Latino, for De La Hoya’s Golden Boy Promotions. Platinum table tickets to the May 22 luncheon, sponsored by Miller Brewing Company, will come with ringside seats for the match and passes to the pre-fight VIP party at the SBC Center; gold table tickets to the luncheon will come with special seating at the match. “We’re delighted that Oscar De La Hoya will join us at what promises to be a fun and also fundamentally important fundraising event for a program that is building a new generation of Hispanic corporate and community leaders,” said Antonio Flores, chair of the ¡Adelante! U.S. Education Leadership Fund, and president and CEO of the Hispanic Association of Colleges and Universities (HACU). Each year, the ¡Adelante! Fund provides Hispanic college juniors and seniors throughout the country with scholarships worth up to $3,000, summer internships at participating corporations, and leadership training. The program was founded by HACU, with continuing support from Miller Brewing, in 1997 and became a separate organization in 1999. Since its inception, ¡Adelante! 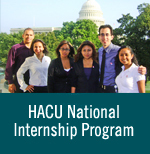 has supported students from 30 HACU-member Hispanic-Serving Institutions, or HSIs. “¡Adelante! plays a critical role in addressing the college and career needs of the country’s youngest and largest ethnic population by providing them the skills and training they need to excel at college, in the workplace and in future leadership positions. Our successful graduates are also becoming role models for the next generation of Hispanic college graduates, workplace professionals and community leaders,” ¡Adelante! Executive Director John Puder said. This year’s ¡Adelante! fundraiser will be followed by an ¡Adelante! Gala May 22 and the 2003 ¡Adelante! Leadership Institute May 23-May 25. Both events will take place at the Marriott Riverwalk Hotel in downtown San Antonio. U.S. Marine Corps Major General Christopher Cortez, the highest-ranking Hispanic officer in the Marines, will address the ¡Adelante! Gala on May 22. The much-decorated officer, a veteran of Operation Desert Storm and former Director of Operations for the U.S. Pacific Command, currently is Commanding General of the Marine Corps Recruiting Command. U.S. Congressman Ciro Rodriguez of Texas, chair of the Congressional Hispanic Caucus, on Saturday will address the opening breakfast session for the ¡Adelante! Leadership Institute. The three-day institute will attract more than 65 top college students from throughout the country, including 38 recipients of 2003-2004 ¡Adelante! scholarships. Corporate and community leaders will address special sessions on graduate education choices, technology, international business communications, community responsibilities, and other professional and leadership development issues. ¡Adelante! alumni will address the students at a special breakfast session May 25. The 2003-2004 ¡Adelante! Scholars, sponsored by Miller Brewing Company and Texas Miller Lite are attending colleges and universities – all members of HACU – in Arizona, California, Florida, Illinois, New Mexico, New York and Texas. HACU represents 340 colleges and universities serving the largest concentrations of Hispanic higher education institutions in the United States. Every college and university in San Antonio is a member of HACU.